Scrape the carrot and skin the onion. Chop the carrot, onion, leek and blanched celery into small pieces and cook them with salt, thyme and the meat in 3/4 litre veal stock for 15-20 minutes in an open pan. Peel the shallots and cook them for 10 minutes in the remaining stock. Remove from the pan, halve the larger shallots and keep them warm. Wipe clean the mushrooms, quarter them and sprinkle with lemon juice. Cook for 4 minutes in the shallot stock, remove and keep them warm with the shallots. Sieve the meat and vegetable mixture and save the stock. Simmer all the stock to reduce it by half. Melt the butter, add the flour to make a roux and gradually add the liquid, stirring all the time. Add the egg yolks and the cream but do not allow to boil. Stir the meat and mushrooms through the sauce and warm through well. Sprinkle with parsley and freshle grated nutmeg. 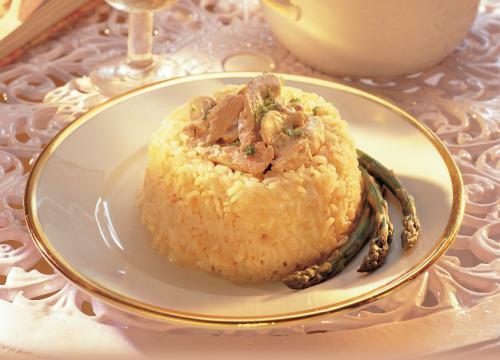 Serve with white rice or mashed potatoes and green asparagus or green beans. * Use pieces of veal tenderloin instead of stewing meat. * Add a dash of calvados or white wine to the sauce.